The withdrawal of former Senate Majority Leader Tom Daschle from consideration as secretary of health and human services follows a long tradition of “blood in the water” politics in a city infested with bipartisan sharks. But it isn’t the sharks’ fault. Politicians keep tossing them food. The sense of entitlement among the powerful and privileged in both parties makes some people think they can live in an exclusive political neighborhood whose access is denied to others. It was the late hotel magnate Leona Helmsley who uttered the immortal words, “We don’t pay taxes; only the little people pay taxes.” Mrs. Helmsley apparently has been reincarnated in the persons of now Treasury Secretary Timothy Geithner and Mr. Daschle. Mr. Geithner “forgot” to pay “only” $43,000 in back taxes and penalties. He paid the Internal Revenue Service shortly before his confirmation hearings when the “oversight” was brought to his attention. Mr. Daschle stiffed the IRS for $128,000 (plus $12,000 interest and penalties), paying up just six days before his first Senate confirmation hearing. (He agreed to a Senate Finance Committee request to pay another $6,000 in Medicare on additional income related to a car and driver. More about that in a moment.) According to The Washington Post, Mr. Daschle waited nearly a month after his nomination before telling Barack Obama of his tax tardiness. When Mr. Daschle was Senate majority leader, one of his perks was a car and driver paid for by taxpayers. When he lost his re-election bid in 2004, Mr. Daschle was given a car and driver by the head of a private equity firm headed by entrepreneur and longtime Democratic Party donor, Leo J. Hindery Jr., according to The Post, which cites a confidential draft report prepared by Senate Finance Committee staff. Naturally, one who had been squired around when he was a senator and public servant shouldn’t be expected to drive himself and search for his own parking spot, or worse, take public transportation. Once someone has enjoyed the power and perks of the Senate, it is difficult to come down to where the “little people” live. Perhaps some counseling would have helped. Mr. Daschle supposedly didn’t know a luxury car service is considered income if provided by someone else. How could he not know since for many years he participated in writing – or at least voting on – tax laws the rest of us must abide by or face fines and possibly prison. Mr. Daschle also made “questionable” charitable contributions totaling $15,000, according to the Finance Committee report, which additionally lists unreported consulting fees. Not reporting income raises red flags with the IRS. It’s not that Mr. Daschle couldn’t afford the taxes. Since leaving office, according to documents filed with the Office of Government Ethics (now there’s a contradiction), Mr. Daschle earned $2.1 million from the law firm of Alston and Bird and, since he left the Senate in 2005, $1 million a year from Mr. Hindery’s private equity firm, InterMedia Advisors. He also made money speaking to and serving on the boards of health-care organizations he would have regulated as HHS secretary. Does anyone else see a potential conflict of interest? Many seem overjoyed at the notion that a woman who doesn’t vote much may become the next U.S. Senator from New York by gaining only one vote herself: the vote of the Governor of New York David Paterson …. Caroline Kennedy wants to be the next senator from New York, but her voting record is already spotty, the Daily News has found. City Board of Elections records show Kennedy has failed to vote in many elections since she registered in the city in 1988 – including votes for the Senate seat she hopes to fill and numerous Democratic faceoffs for mayor. Caroline Kennedy, daughter of former President John F. Kennedy, listens to a reporter’s question. Kennedy is campaigning for the open Senate seat vacated by Hillary Clinton. “It doesn’t speak to a deep-felt commitment to the electoral process,” Baruch College political scientist Doug Muzzio said when told of Kennedy’s ballot breakdowns. 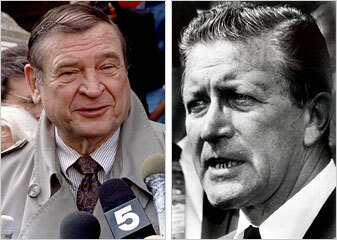 Records show Kennedy did not pull the lever for any of her fellow Democrats in city primary races for mayor in 1989, 1993 and 1997 and 2005, which Republicans went on to win three out of four times in the general election. She was also AWOL for the primary and general elections in 1994, when Sen. Daniel Moynihan was running for reelection to the seat Kennedy hopes to hold. It’s Caroline Kennedy’s Sense of Entitlement or U.S. House of Lords? idea, wrong argument. The problem with Caroline Kennedy’s presumption to Hillary Clinton‘s soon-to-be-vacated Senate seat is not lack of qualification or experience. The Senate houses lots of inexperienced rookies — wealthy businessmen, sports stars, even the occasional actor. The problem is Kennedy’s sense of entitlement. Given her rather modest achievements, she is trading entirely on pedigree. I hate to be a good-government scold, but wasn’t the American experiment a rather firm renunciation of government by pedigree? Yes, the Founders were not democrats. They believed in aristocracy. But their idea was government by natural — not inherited — aristocracy, an aristocracy of “virtue and talents,” as Jefferson put it. You are currently browsing the archives for the Entitlement category.